A look at how vinyl is manufactured. Today, living an entire day without vinyl is virtually impossible. Products made of vinyl package our food and drink, trim out every car built and protect millions of professional and weekend athletes. 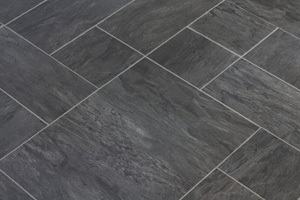 With such a total presence in our lives, one would think the manufacturing of vinyl flooring would consist of a simple, age-old process, repeated as needed. Well, think again. 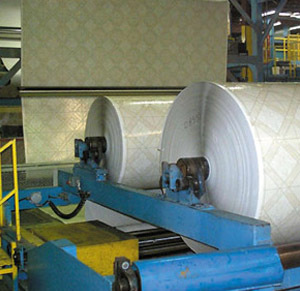 The production of vinyl flooring uses highly sophisticated techniques, complex methods and precise systems. All to provide you with beautiful high quality, high performing vinyl flooring. Recently, a newer process has been developed that offers you even more beautiful, durable and fashionable choices. We invite you to read on and build your knowledge as we explain how vinyl flooring is made. Who knows, what you learn here and in the other vinyl sections just may turn your home into one decorated with one of life’s most popular products. The rotogravure process spins out unlimited choices. The rotogravure printing process is the most commonly used method for making residential vinyl floors. It offers you unlimited possibilities in pattern and design. The rotogravure process involves a print cylinder that spins around while the vinyl's core layer (called the gel coat) passes underneath. The cylinder systematically prints various colored ink dyes to create the pattern. After the print dyes are set a clear wearlayer is applied to the surface. The appearance retention of a rotogravure vinyl floor is dependent on the durability of the clear wearlayer. Know this about vinyl flooring. The wearlayer is absolutely critical to the performance of your vinyl floor. The thickness of the wearlayer varies with each vinyl product collection, or series, and is generally measured in mils. The thickness of a mil is about the same as a page in your telephone book. So a 10-mil wearlayer would be comparable in thickness to about 10 pages of your telephone book. Generally, the more expensive vinyl floors have thicker wearlayers. Your expectations for how long your vinyl floor will look new and attractive are based on the wearlayer's performance. To help you understand wearlayer capabilities we need to define what the performance characteristics are that you are looking for in a vinyl floor. The easy to clean characteristic relates to how tough it is to remove soiling and other marks from the floor's surface. When a floor begins to look old and drab it is usually caused by hundreds of fine hairline scratches in the wearlayer. These fine scratches come from dirt, grit and sand laying on the wearlayer's surface. However there’s good news. The new generation of vinyl floors has all the ingredients to resist showing wear and staining. Plus all the beauty, style and value to certainly put vinyl in the running as a potential flooring for your home and home life. This concludes our section on how vinyl is made. If you’re looking for flooring that offers many distinctive choices, built-in beauty and easy care, plus hard to beat value, this product should be on your shopping list.